Almost a year to the day that the city removed campaign signs, touching off a lengthy court battle, the Rehoboth Beach city manager ordered the city's parking meter department to remove a sign on Rehoboth Avenue at Fourth Street early Saturday afternoon. Removed were two signs -- one promoting a yard sale on Fourth Street, and a second advertising a Coldwell Banker open house. 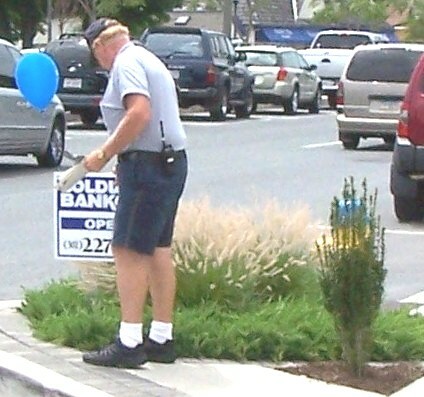 Moments after the parking meter department tech, below, tears down the BIG YARD SALE sign, he heads across Fourth Street with the yard-sale sign folded in his left hand and pulls out the COLDWELL BANKER OPEN HOUSE sign before heading back to his van. 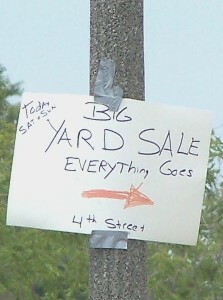 The yard sale signs were erected again on Sunday, and once again removed by the parking meter department. Sunday evening, several COLDWELL BANKER OPEN HOUSE signs were in the "sign impound" behind the Rehoboth Building & Licensing complex off Rehoboth Avenue. The parking enforcement supervisor said over the radio that the city manager had asked them to remove the yard sale sign on Saturday. Last year, it was a Building & Licensing worker who was accused of removing campaign signs. This comes after a state judge ordered the city to evaluate its ordinance regarding street signs and enforcement policies, and days after the city restated its policy. Perhaps it was a clever attempt to skirt state or county laws regarding roadside advertising. But it was an interesting coincidence that Rehoboth Beach removed signs in town while London Fog used "human signs" outside of town. 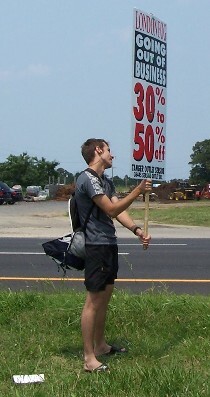 What appeared to be exchange students held signs in the median Sunday afternoon on busy Coastal Highway to promote London Fog's going out of business sale. An SPCA worker requested a Rehoboth Beach police officer to help him seize a dog from a woman in the 300-block of Hickman Street Saturday afternoon. When police officers arrived just before 2:30 p.m., a woman reportedly took the animal and fled. 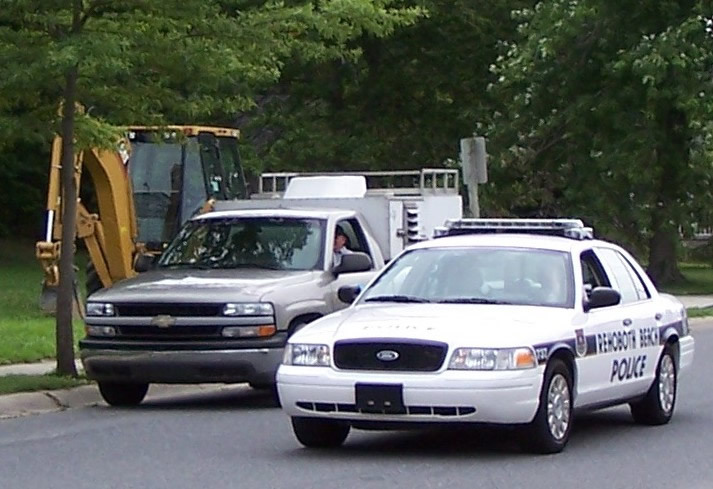 Police broadcast a lookout for a white Acura MDX with Maryland tags. A man gardening next door said his neighbor's daughter left abruptly with a dog or some unusual animal when the SPCA arrived. When asked about the SPCA's visit, a man on the porch of the house targeted by the SPCA said "No, we're good... no more questions." Below: The SPCA worker and two Rehoboth Beach police officers chat across from the target house. LIFEGUARDS REQUEST TOW TWICE FOR SAINT LAWRENCE ST.
Twice in one week the beach patrol requested unauthorized vehicles removed from parking spaces marked LIFEGUARD PARKING ONLY on Saint Lawrence Street. 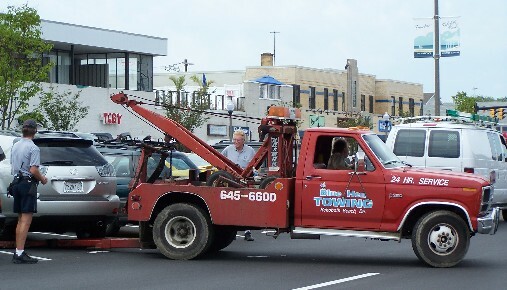 This was the scene on Friday around 12:40 p.m. when Coastal Towing removed this blue Toyota Camry. The officers watched over the parking space for about 50 minutes until the tow truck arrived and hauled the Camry to the impound. The situation is similar to Stockley Street where a single sign designates two spaces for lifeguard parking. 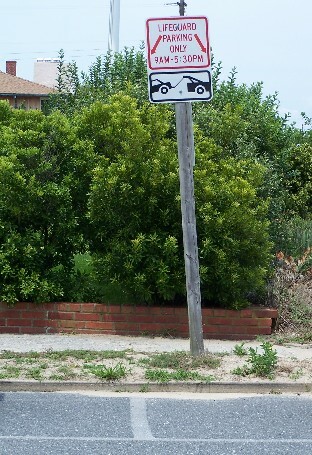 But the sign does not appear on the center line between the spaces. Shown below is the Saint Lawrence street sign. Police were requested to this space on July 2 and July 7 for unauthorized vehicles. 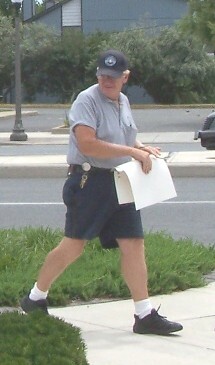 The beach patrol requested police to the Stockley Street space on July 3. Last season the beach patrol called police at least nine times to remove unauthorized vehicles parked on Stockley Street. City lawmakers discussed the lifeguard parking spaces on Dec. 19, but they lacked a quorum so no official meeting was held. This Lexus RX 400 was one of several vehicles towed this past weekend by Rehoboth Beach parking enforcement. A ticket writer discovered it parked around 11:30 a.m. Saturday in the second block of Rehoboth Avenue across from Browseabout Books. The owner reportedly owed the city $250 in fines plus any tickets issued Saturday, and must pay towing and storage charges. 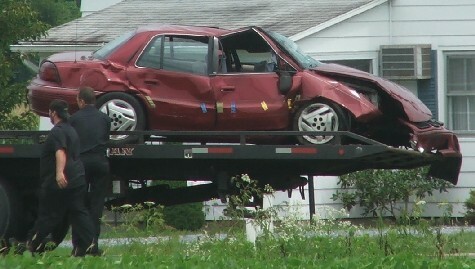 The driver of this vehicle (above right) was trapped and seriously injured Saturday in a crash. The accident happened around 2 p.m. on Bishopville Road east of Worcester Highway in Bishopville. 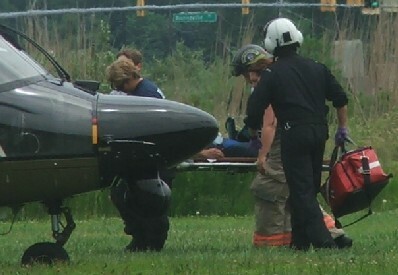 Rescuers load the patient (above, left) onboard Maryland State Police Trooper 4 for a flight to Peninsula Regional Medical Center. Photos by Jessica Wagaman/Christopher Casale, Breaking News Network freelance photographers. Five workers were injured after part of a building collapsed while concrete was being poured. It happened at the Americana Bayside development around 10:50 a.m. Friday. 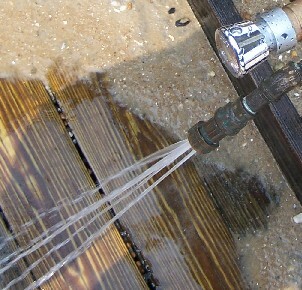 The development is off Route 54 between Fenwick Island and Selbyville. 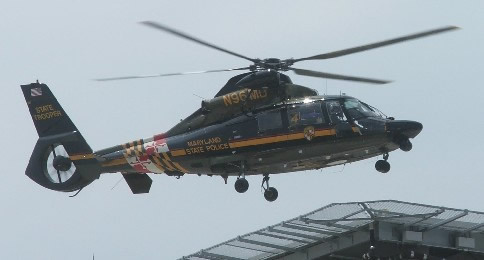 Maryland and Delaware state police helicopters flew two of the injured to Salisbury, and the others were taken to hospital by ambulance. Occupational Safety & Health Administration was requested to investigate. 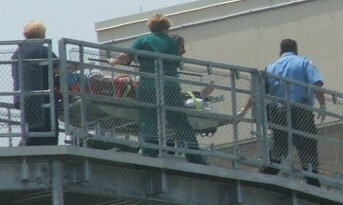 Maryland State Police Trooper 4, based in Salisbury, lands on the roof of Peninsula Regional Medical Center with one of the injured workers (above). Photos by Christopher Casale/Jessica Wagaman, Breaking News Network freelance photographers. A fire was discovered in the Midway Village Shopping Center, which is in the process of being demolished, around 12:45 p.m. Sunday. The bulk of the fire was reported in the shop once occupied by Dragon's Lair. A Lewes firefighter said over the radio that a witness claimed a couple people ran from the shopping center prior to the fire. 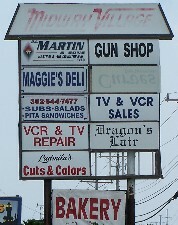 The old strip-style shopping center is between Rehoboth Beach and Lewes on Route 1, and was once home to some established businesses which had been there for years. Below, Chuck Snyder, Rehoboth Beach VFC safety officer, takes a picture of a Lewes firefighter chatting with a reporter while other firefighters check for fire in the shopping center's roof. OH NO! 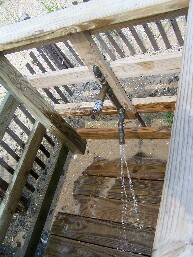 REHOBOTH FOOT SHOWERS STUCK AGAIN! The foot-showers on Maryland Avenue (right) and Baltimore Avenue (left) ran continuously all weekend long, despite the efforts of some Good Samaritans who attempted to shut them off. Well, almost. The visibility was excellent both Friday and Saturday. Below is Cape Henlopen as seen from the beach near the Henlopen Condos in Rehoboth Beach. 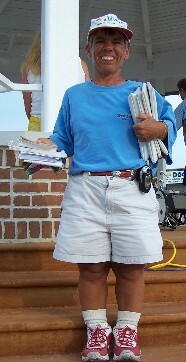 Cheryl Blackman smiles on the Rehoboth Beach bandstand Sunday evening. She is selling KINfolk raffle tickets and wants to surpass the $21,520 she raised last year. As of Sunday (July 9) she reports $8285 with the sale of 1657 tickets. Cheryl says bar patrons have been most generous. Cheryl has been in eight movies and four commercials. When she isn't collecting for charity in local restaurants, you can purchase a raffle ticket from her at the north boards Grotto Pizza. These are the Lake Gerar Mallard ducks sneaking a snooze early Friday evening. Earlier the Mallards frolicked in the Breakers Hotel lawn sprinklers.